What Fruits Are Actually Vegetables? Can I Peel Tomatoes & Freeze Them Without Blanching? Heirloom tomatoes are very nutritious and can make up an important part of a balanced diet. They may have important cancer-fighting properties; however, the current data is not strong enough to claim that they are definitely cancer preventers. An heirloom tomato is not just one kind of tomato. Rather, it's any tomato variety that has been passed down through the generations. It is, literally, an "heirloom," in the same way that family treasures are heirlooms. There are four general categories of heirloom tomatoes: 1) Commercial varieties, which are those tomatoes that have been in production for more than 50 years; 2) Family varieties, which are those tomatoes that have remained in production on a family farm for several generations; 3) Engineered heirlooms, which are heirlooms created by crossing an heirloom with a non-heirloom or two heirloom varieties of tomato; and 4) Naturally occurring crosses of previously existing heirloom tomatoes, which cross-bred in the wild and remain in production today. As there are many varieties of heirloom tomato, it shouldn't be surprising that there is no one nutritional makeup of an heirloom. However, in general, one medium-sized heirloom tomato contains about 35 calories, 1/2 g of fat, 1 g of protein and 7 g of carbohydrates, of which 4 are simple sugars, 1 is fiber and 1 is complex sugars. These values are only 1 to 2 percent or less, of your recommended total daily intake of calories, fat, protein and carbohydrates. Where heirloom tomatoes really shine is in the vitamins and minerals they contain. For example, a medium-sized heirloom tomato contains about 20 percent of your daily recommended intake of vitamin A and about 40 percent of your daily recommended intake of vitamin C.
The United States Department of Agriculture recommends that people eat a healthy, balanced diet consisting of a mix of proteins -- for example, meats and beans -- fruits, vegetables, grains, dairy products and fats. An average adult should consume 2 to 3 cups of vegetables a day. One large heirloom tomato, or two small heirloom tomatoes, equals about a cup of vegetables. While heirloom tomatoes are rich in some vitamins and minerals, they are poor in others. For example, heirloom tomatoes are relatively iron-poor and contain less folic acid than spinach, a typical serving of which contains about 3 percent of your daily recommended intake of iron and more than 100 percent of your daily recommended intake of folic acid. There appears to be a link between tomatoes and a reduced incidence of diseases like cardiovascular disease and certain cancers. Whether this link is the result of something intrinsic in the tomato or is simply occurring because people that eat tomatoes are more likely to do other healthy things and therefore are less likely to get cardiovascular disease and cancer is unclear. Most recently, for example, there has been interest in the purported prostate-cancer preventing effects of lycopene, which is derived from tomatoes. According to Edward Giovannucci, in the November 2002 issue of "Experimental Biology and Medicine," current epidemiologic data do not clearly support a role for lycopene in the prevention of prostate cancer, but further research is needed to definitively answer the question. In any event, whether or not heirloom tomatoes prevent prostate cancer, they are certainly a healthy and appropriate part of any balanced diet. 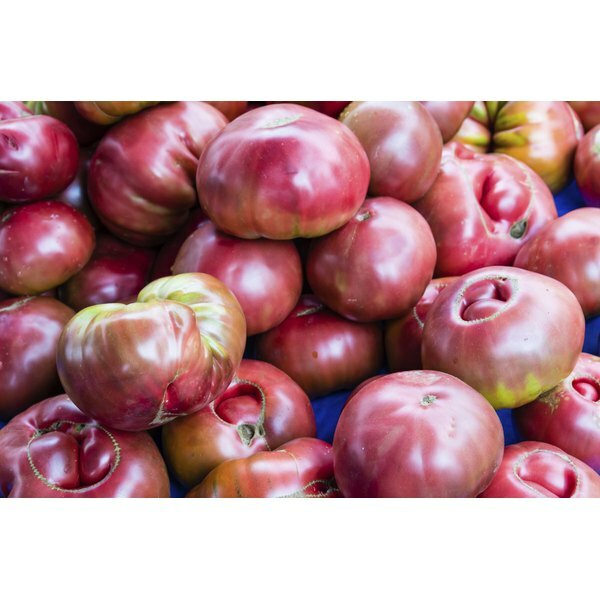 Tomatofest: What is an Heirloom Tomato?